A leader of the Karen National Liberation Army has called for continuing the fight for ethnic autonomy, but through peaceful, political means. Speaking on the 67th anniversary of Karen National Martyrs’ Day, General Saw Johnny said Karen autonomy has not yet been realized, and the sacrifice made by Karen martyrs has not yet been fulfilled, but he added that violence was not the way to achieve these goals. “Although we have fought with arms for over 60 years, we still haven’t achieved the expectations desired by the majority. 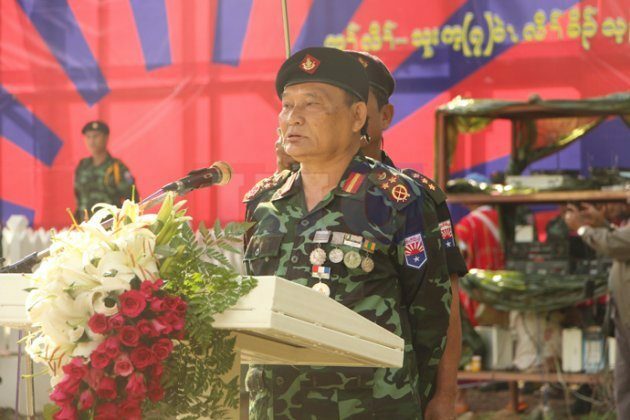 That’s why we are trying to find the solution to fulfil the desire of the entire Karen people without any more bloodshed,” the KNLA’s chief of staff said during a speech at the KNLA 7th Brigade headquarters on August 12. He added that the KNU’s first chair, Saw Ba U Gyi, and other martyrs sacrificed their lives to free the Karen people from oppression and to make the world recognize the Karen people as a race with its own state and rights. The KNU designated August 12 Karen Martyrs’ Day in memory of Saw Ba U Gyi and Major General Sai Kay, who were killed on August 12, 1950. The 67th anniversary of Karen Martyrs’ Day was commemorated in Karen State, Mon State, Yangon Region and Tanintharyi Region, as well as by Karen people living abroad. Over 1,000 people attended the Division 7 headquarters ceremony, including KNU leaders, representatives of the KNU/KNLA Peace Council, officers from the Karen State Border Guard Force and members of the public. In addition to speeches by Gen Saw Johnny and the KNU’s vice chair P’doh Saw Kwe Htoo Win, gifts were given to the families of fallen martyrs and a military parade was held. “I’m proud to learn about the Karen martyrs who sacrificed their lives for their country and their people. We will strive to achieve self-determination, which was the hope of the martyrs,” said Mahn Thein, a student from the KNU’s Karen New Generation School who attended the ceremony. The KNU signed a preliminary ceasefire with the government in January 2012 and signed the nationwide ceasefire agreement along with seven other ethnic armed organizations on October 15, 2015. Members of the KNU have been actively encouraging other ethnic armed groups to join the political negotiations by signing the NCA.